When you're first learning steel guitar, you may not have an idea exactly where you're headed musically. You'll probably want an instrument that is modestly priced and playable. I would suggest a basic 6-string or 8-string single neck model. 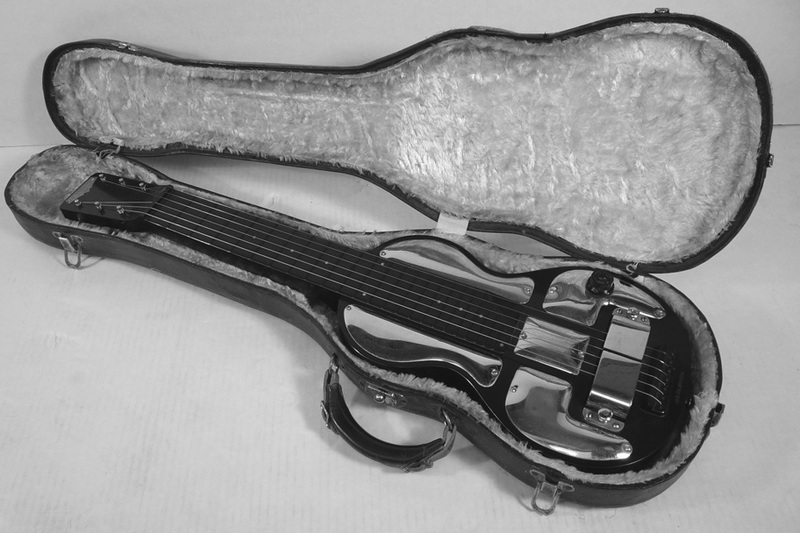 A beautiful prewar Rickenbacher Electro and original case owned by HSGA member Mark Harpainter. For more information on current steel guitar builders, check out the great listing on Brad's Page of Steel. In most cases, vintage steel guitar models will show signs of wear and tear. This is normal. However, there are some things you should watch out for as you shop. Also, be advised that newly manufactured steel guitars can exhibit some of the problems listed below. Check that the volume control knob works and that the instrument delivers a relatively strong signal when the volume is turned all the way up. If you're getting a lot of noise and static from the instrument, move the volume knob back and forth rapidly and see if the problem goes away. If not, the instrument may need servicing; if you decide to purchase the instrument make sure you have access to a reliable guitar technician or music store repair facility. Check that the string spacing on the bridge is even. In many cases, such as the Fender models, you can adjust the spacing by simply loosening the string slightly and moving it up or down along the bridge. Beware, though, of a bridge that is full of grooves created by string friction. The string may buzz if it gets caught in any such groove and it may be difficult to place the string away from the groove without throwing off the spacing between the strings. It is important that you can achieve even spacing of the strings at the bridge. The strings should not be too close to the pickup or too far away. An eighth inch is about right. If the strings are too close to the pickup, they will slam against it once you start playing with the weight of the bar pressing down on the string. If there is no way to adjust the pickup downward, you should reject such an instrument. If the strings are more than an eighth inch from the pickup, you'll be okay as long as you get a reasonably loud volume out of the instrument with the volume turned up. One of the worst problems you can have is an excessively worn nut. Beware! When you place the bar on the first or second fret, the bar should make contact with all of the strings when you apply light downward pressure on the bar. You can sometimes sight along the nut and determine whether or not the strings near the nut provide a flat surface for the bar to rest on. If the strings rest on a cylindrical metal nut (Fenders use this type of nut) and there are no grooves on the nut from string wear, you shouldn't have problems. If the nut is made of bone (Nationals, for example) or is part of the bakelite body (Rickenbackers), the nut is grooved by the manufacturer. These grooves are often tampered with or excessively worn creating a disparity in the string level. If the damaged grooves aren't too deep, you can get a guitar technician to file down some of the grooves to make all the strings level. If you have a grooved nut, make sure the spacing is even. If the string rests on a cylindrical metal nut, you can easily adjust the spacing as long as you have sufficient smooth, unworn areas of the nut to accommodate adjustments you make. If the spacing is off on a grooved nut, make sure you have access to a repair tech who can fix the problem at a reasonable price. Spacing problems on a bakelite Rick could be a real problem, especially if the grooves have been excessively worn and tampered with.